Repairs and Drama. In the Windswept Salt Marsh. 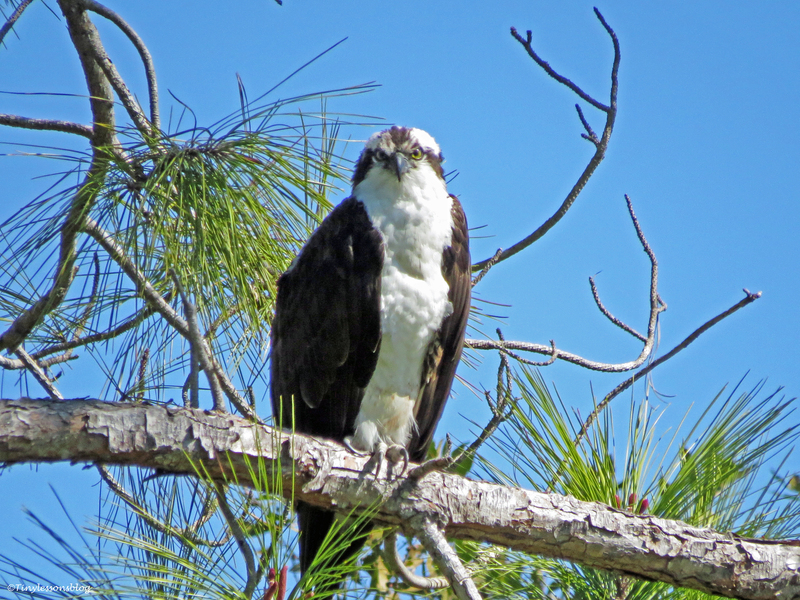 In battering winds and close to freezing temperatures, with a wind chill factor much below freezing, Mama Osprey was tightly pressed down in the middle of the nest in her Florida coat. Her head was down and pointed against the wind. She didn’t move. She was protecting her egg(s). 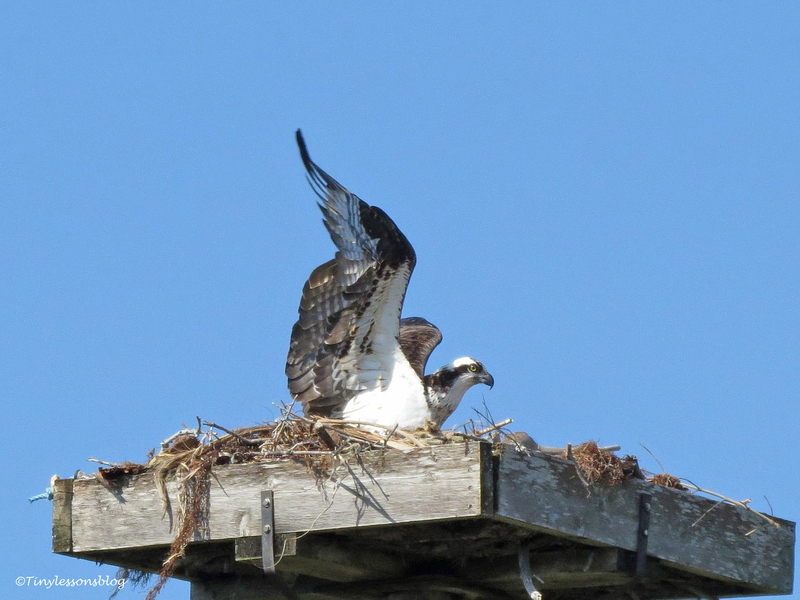 I saw all this from my office window and decided to dare the cold to check on the Osprey Family. 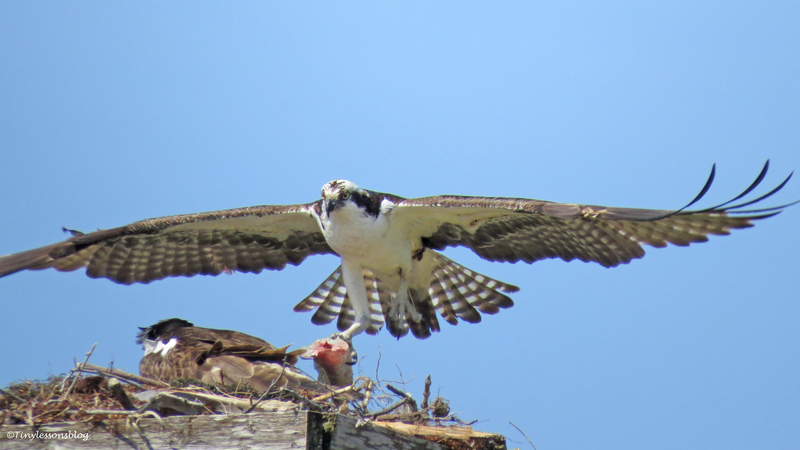 When I arrived, Mama osprey acknowledged my presence. 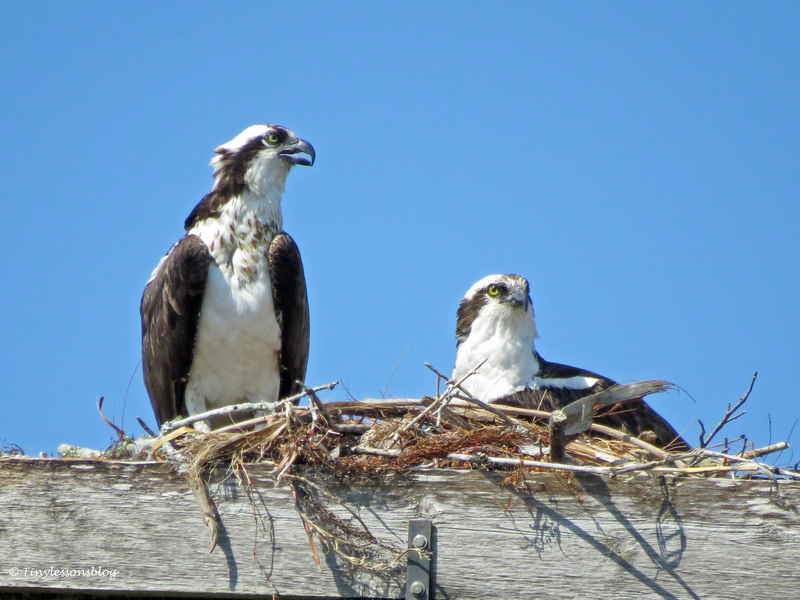 Papa Osprey was nowhere to be seen. I walked over to his “man cave”. He was not there. Then I spotted him huddling in a pine tree close by. He appeared to be wet. Maybe from an unsuccessful fishing trip in the stormy bay waters on the coldest day this winter. That was on Thursday. Yesterday the weather improved slowly. The winds calmed down a bit, and after the coldest morning this winter, the temperatures climbed to balmy 49F (9.5 C) in the afternoon. 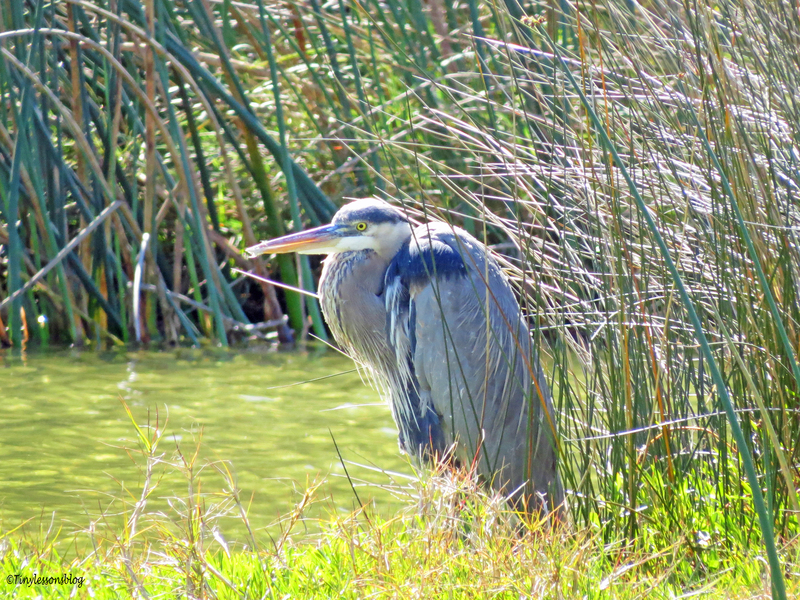 Most birds were still in hiding when I arrived in the salt marsh, but the “Mayor” himself was hunching on a small islet. I guess he wanted to give reassurances to the other residents. This too shall pass. I found Mama Sandy eager to repair her nursery after the stormy night. She gave instructions to Papa Stanley to bring home some sturdy materials. And he promptly delivered a long stick. But it didn’t seem to be quite what Mama needed. So she left the nest, just for a couple of minutes, to do the shopping herself. And brought home a large piece taken from a palm tree. She then arranged the nest to her liking, and sat down on the egg(s)again. That’s when a threat appear in the sky. 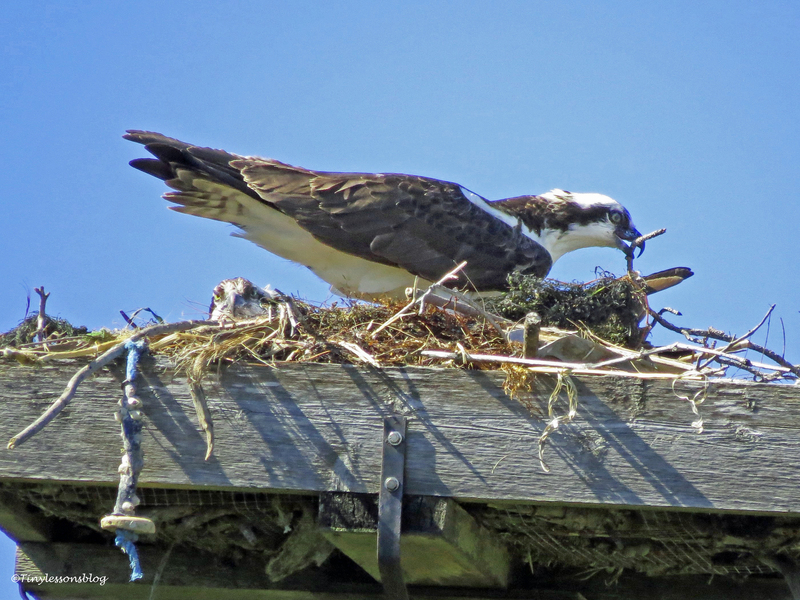 Mama sounded an alarm, and Papa Stanley hurried back to the nest. 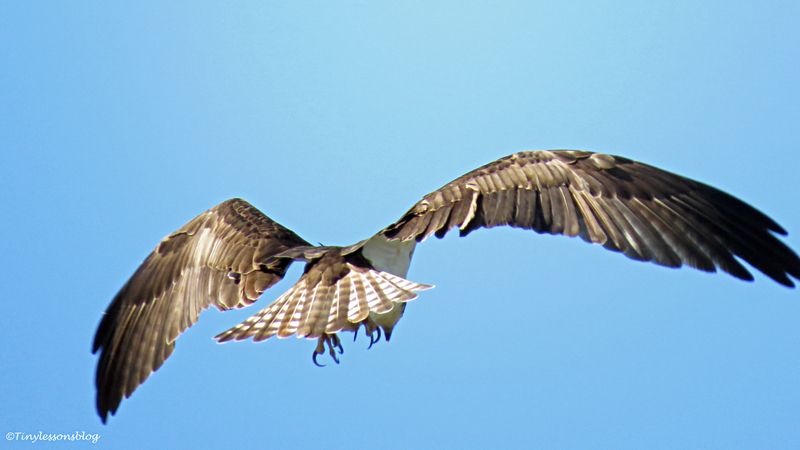 Osprey Steve was flying over the nest. Repeatedly. With a half eaten fish in his talons. …with a half eaten fish. It’s Steve. After the “situation” was over, Mama Sandy asked for fish. And Papa flew away again. Life was returning to normal in the salt marsh. 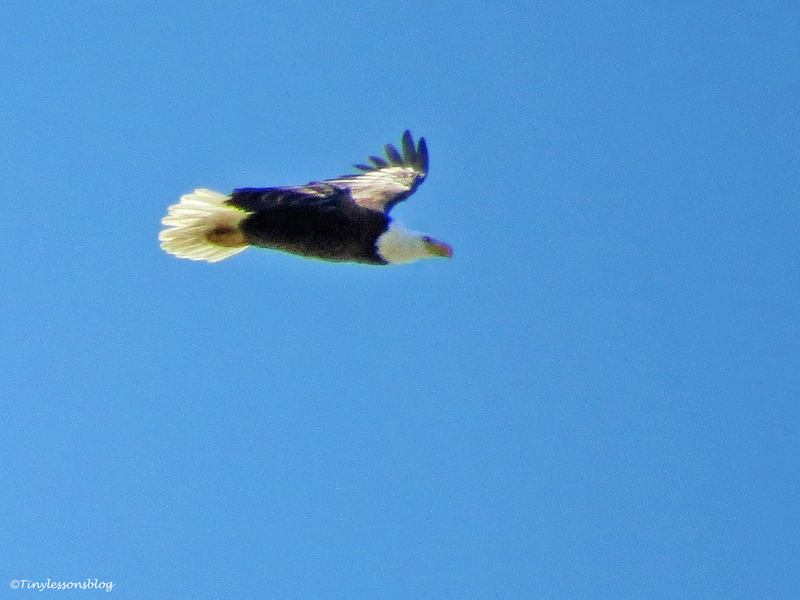 On my way home I spotted him scanning for fish above the bay, but couldn’t stay long enough to see the outcome. 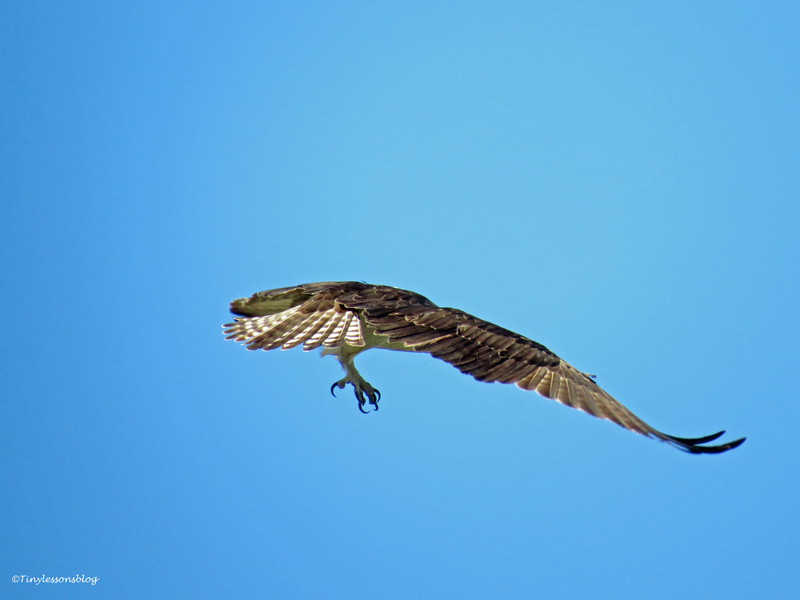 But about half an hour later, I saw him fly past my office window with a small shiny fish. All was good. This morning was beautiful. The winds were weak and the temperatures climbed steadily. I just had to get out for a long walk. The salt marsh was bustling with activity. Ibis, Night Herons, Blue Herons and Egrets were out and about. 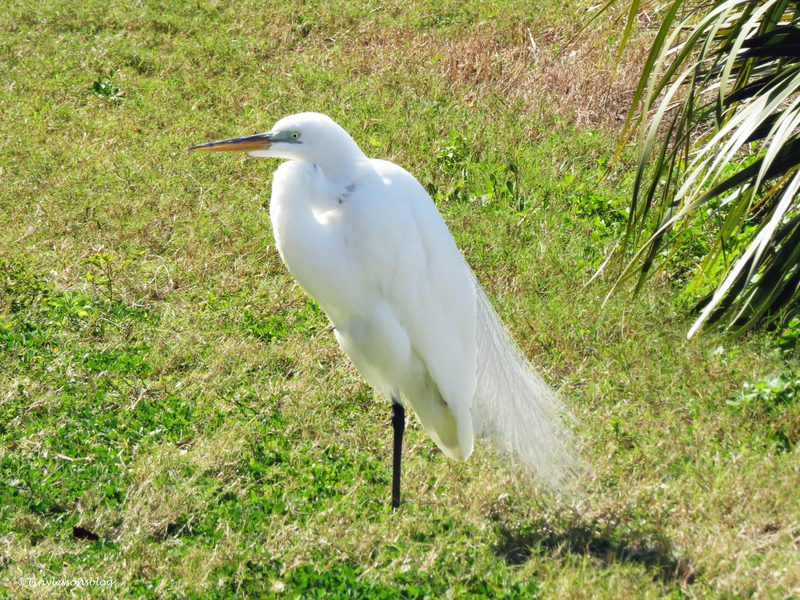 A Great Egret airs her plumes in the sunshine. 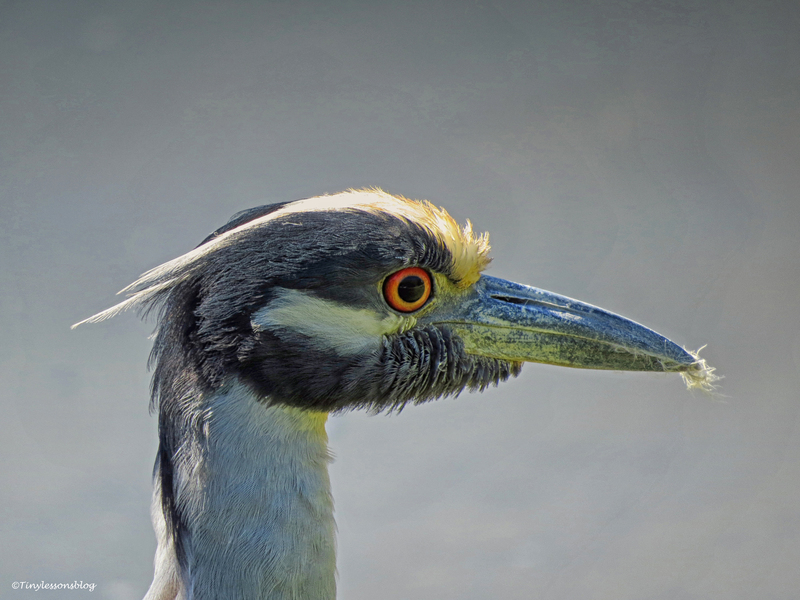 A Yellow-crowned Night Heron is completely awake. 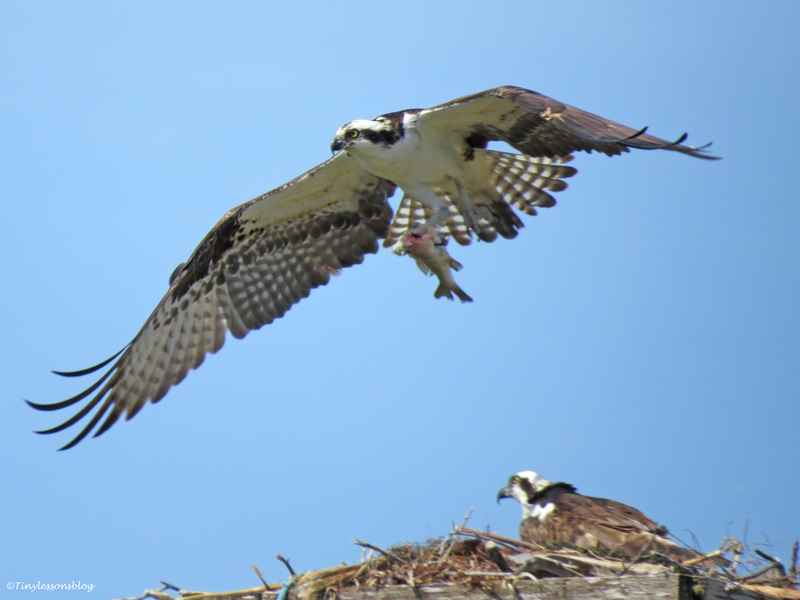 When I arrived to the nest, Mama Osprey had just finished eating . As usual, Papa Stanley took the rest of the fish and flew to finish it off in his “man cave”. But he didn’t eat. Something else had caught his attention high up in the sky. …but he can’t eat. There’s danger on the horizon. I looked up too and saw what seemed like two huge birds circling high, high up in the sky. I took my camera and zoomed all out. Two Bald Eagles. The only real danger to Ospreys, apart from man-made hazards. 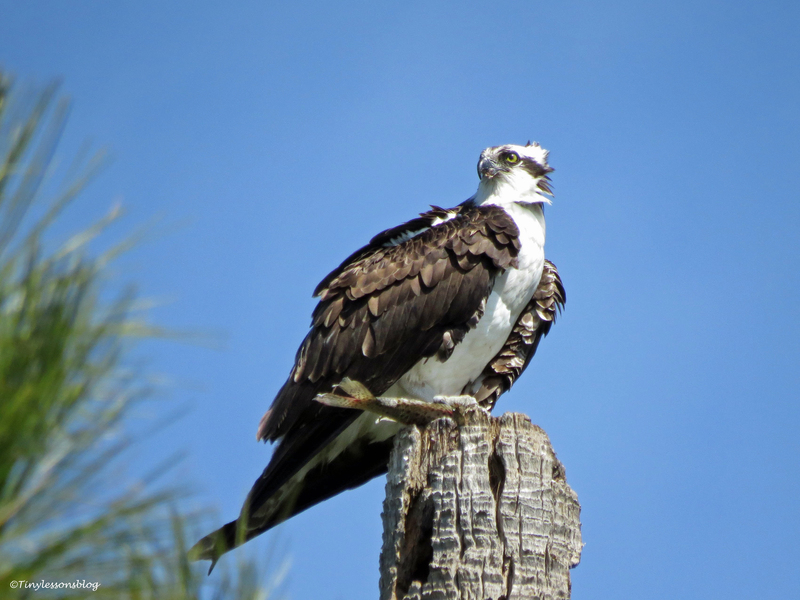 Papa Osprey didn’t move. His eyes followed the two birds with complete concentration. 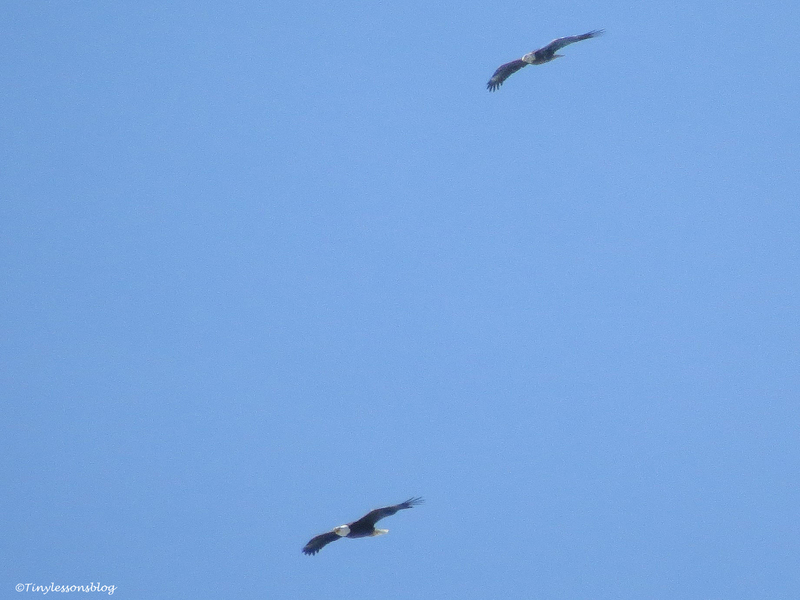 Could these two be Bald Eagles? I ran back to the nest. 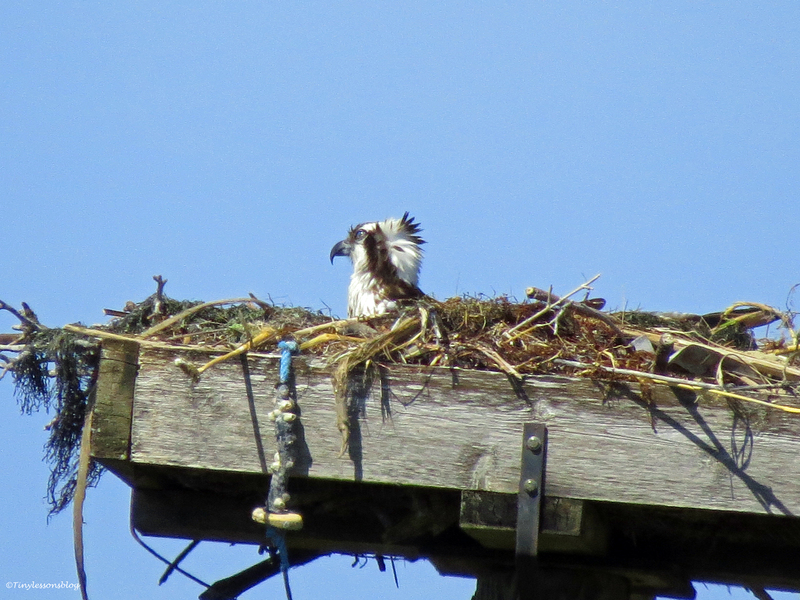 Mama Osprey sat on her egg(s), quietly without a peep. Watching the danger in the sky. No alarm calls. It was better to remain silent and pretend to be invisible. 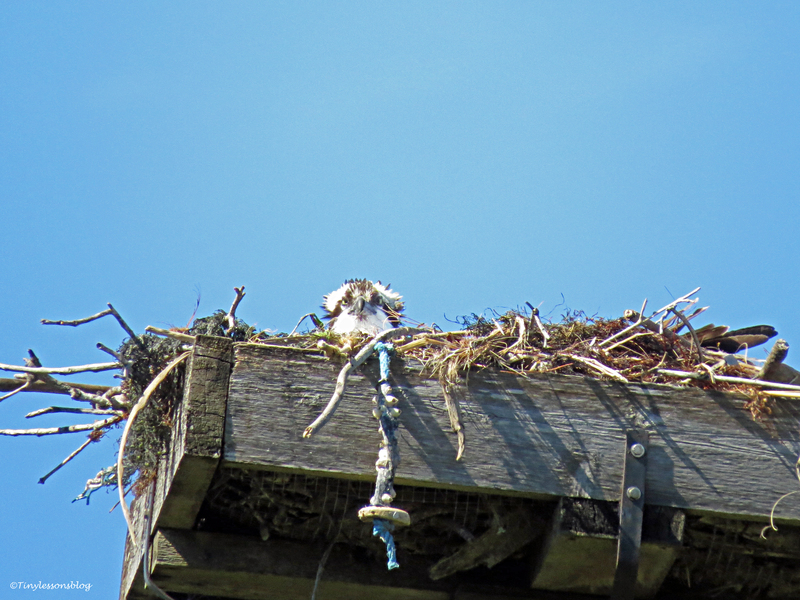 I knew there was a Bald Eagle nest on the other side of the bay, and gathered this might be the couple. They appeared to be completely taken by their courting dance high up in the air, and not hunting. After about five minutes they disappeared towards the bay. I could almost hear the sigh of relief from Mama Sandy. 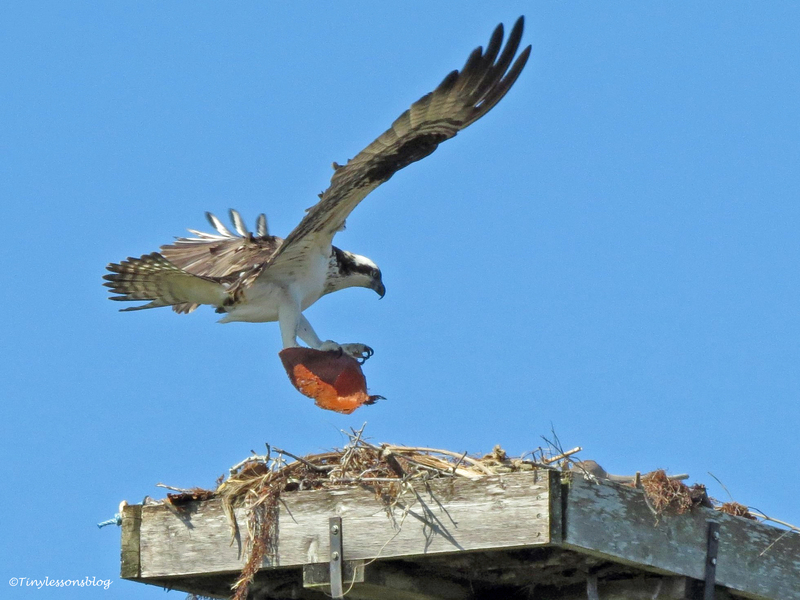 And soon Papa Stanley arrived back to the nest with his still uneaten fish. Better safe than sorry. 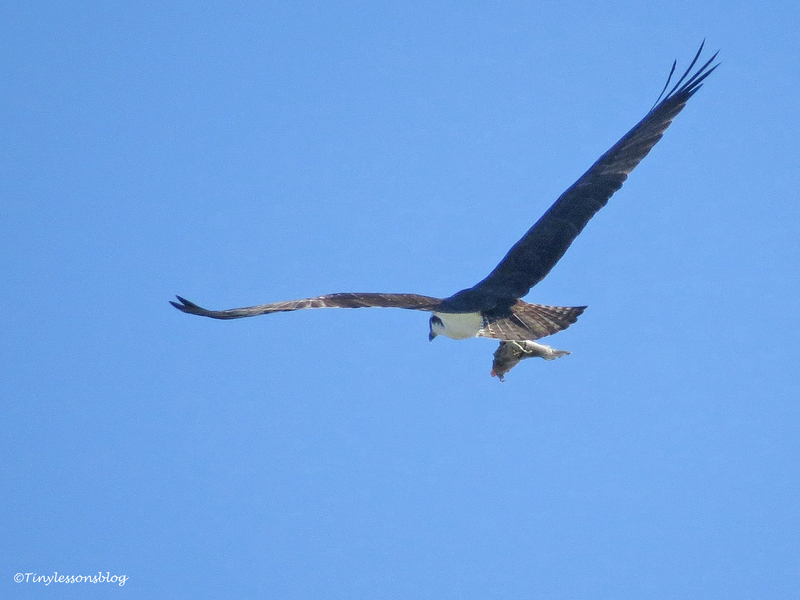 Papa Osprey returns with his fish…to be with Mama. The danger was over and weekend was going great again.